Man, I love the ’70s. They continue to be an endless well of entertainment. 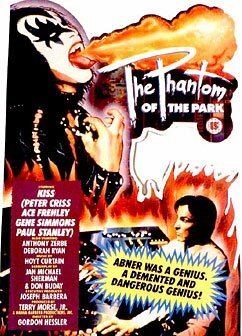 I remember seeing KISS Meets the Phantom of the Park on TV as a kid, shortly after the equally hysterical Star Wars Holiday Special. Watch either of them today and you’ll have trouble believing they are real. But thank goodness, they are. The Star Wars special included a coked-up Carrie Fischer cameo, and brought Wookiee Life Day into the national consciousness; the KISS movie scarred us more deeply, and we hid it like a bruise from a drunken stepfather. KISS was one of the biggest groups at the time, appealing to teens because of the heavy glam rock music in the age of disco, and to kids due to the crazy costumes. I idolized them as a child. I had the action figures. I dressed as Peter Criss one year for Halloween. Sadly no photos exist to record this infamy, but take my word for it. I played my tape of Dynasty until it wore out. But this movie, even the band despises. Hell, even Peter Criss- who I’ll admit despite my childhood obsessions, was probably the least talented member of the band- wouldn’t even show up to record his lines, and had to be dubbed by his stunt double. No, I’m Back in the New York Groove! Loosely based on the Phantom of the Opera, which had already gotten the ’70s glam-rock treatment with Brian DePalma’s Phantom of the Paradise, the thin story involves an overzealous designer of animatronics at a big amusement park. KISS is playing a concert there, and is stealing the thunder of his Westworld-style robots who are stationed around the park, posing as kabuki samurai or gorillas in cages. When he’s fired, he decides to clone KISS and make robots of them, so he can rule the planet with their rock and roll. But KISS won’t stand for that. See, they aren’t just rockers, but have been granted powers by their strange talismans, which they protect in a glass case. 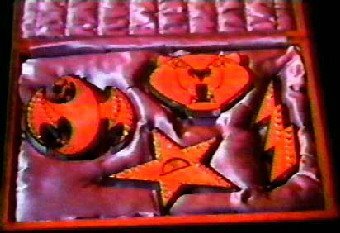 The talismans which give KISS all their powers! The KISS personae, which casual fans might not even know about, are- the Starchild, Paul Stanley, whose vocal prowess and star-shaped eye makeup grant him eye laser beam powers, among other things. Gene Simmons is the Demon, who can breathe fire and growls like a tiger; Ace Frehley, the Space Ace,can teleport, and Peter Criss is the Catman, who mentions having 8 lives, and is the useless Aquaman of the group. But hey, he’s got a cape. 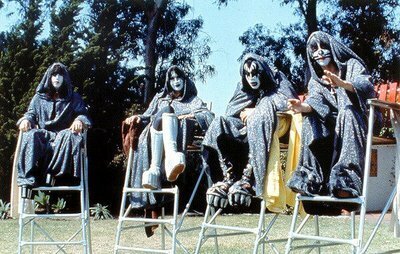 In fact they all wear faux chain mail capes, even as they lounge around the pool at the KISS Mansion. 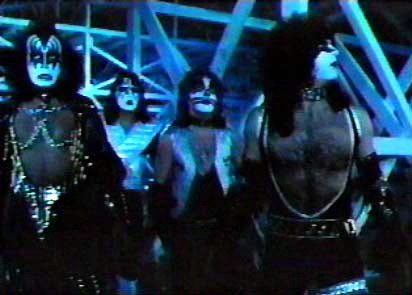 Even though KISS was nearing their peak of popularity, the movie was relegated to TV in the States, and the original plan to have all new songs for the movie was shelved. The network thought it was too scary- laughable today, or even when compared to ’74s Don’t Be Afraid of the Dark– so the cheesy battles between KISS and the renegade robots were set to goofy cartoon music. Hell, the whole thing was produced by Hanna-Barbera, so I’m surprised Scooby Doo and Shaggy didn’t show up to pull the mask off the bad guy. It really must be seen to be believed, so I’ll let you be the judge. I have some very, very fuzzy memories of watching this movie when it first aired. In the dark ages before the internet and the re-release of practically everything on DVD, it took on an almost mythical status in my young, raging KISS fan’s mind.When I finally saw a crappy VHS copy in 1990, I was old enough to appreciate the kitsch factor and be more amused than disappointed.I especially like how Ace’s stunt double is about a foot taller than him, and has a completely different facial structure that’s obvious even through the makeup. now you know where KISS Saves Santa came from… and the Family Guy version is probably much more entertaining. This one is fun for fans or nostalgia, but cheese and chest hair don’t mix.